Southlanders will be seeing more familiar faces on TV starting on Sunday, when a new ad featuring Barnes Wild Bluff Oysters hits the airwaves. The NZ Post ad stars Barnes general manager Graeme Wright and his team as they return from a day’s harvesting in Foveaux Strait to unload at the Bluff wharf. It showcases NZ Post’s overnight delivery service and its importance to regional companies like Barnes. 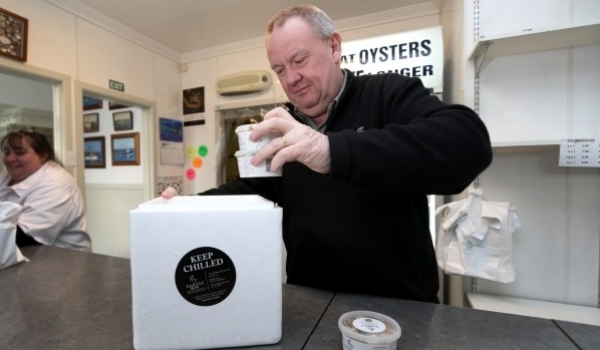 “It’s really important for us with oysters that we have the confidence they’ll get to where they need to go while they’re still fresh,” Wright said. Wright said Barnes also made use of NZ Post’s tracking system for deliveries to keep both the company and the customer up to speed. The company had received a lot of positive comments on its new branding since changing its name to Barnes Wild Bluff Oysters, and the ad was a good way to show off the fresh new look, he said. NZ Post spokeswoman Sarah Austen-Smith said the finishing touches were being applied to the ad on Wednesday and it would be on air from Sunday. The ad is part of NZ Post’s ‘You Can’ campaign.